For the second year running, Portland International earned J.D. Power’s highest satisfaction score among major airports. “Portland is a slam dunk,” says J.D. Power’s Garlick, noting its top amenities, like free Wi-Fi, low flight delays, and high marks for baggage handling and security. What really sets this Oregon airport apart, though, is the range of food, shopping, and entertainment options. PDX has more than 30 restaurants, including farm-to- market café Capers et Le Bar, local favorite Blue Star Donuts, and several popular food truck vendors. At the House Spirits Tasting Room, anxious fliers can calm their nerves with a dram of Westward Oregon Straight Malt Whiskey. Florida’s Tampa airport ranked highest for the ease of its security process in J.D. Power’s 2016 survey. That’s a particular achievement, considering that J.D. Power reported an 8% increase in the wait time travelers spent in security lines over the past year. Tampa owes its speed to a decentralized design with multiple security checkpoints. That gives travelers more time to explore the 45 shops and 34 restaurants, a dozen of which opened in the second half of 2016 alone. Southwest, a top MONEY airline, is Tampa’s largest carrier, serving about 35% of the airport’s passengers. Detroit Metropolitan Wayne County Airport (DTW): This midwest airport is known for is underground Light Tunnel, which is lit by colored LEDs and runs for 700 feet to connect the two terminals. San Diego International Airport (SAN): San Diego rolled out enhanced Wi-Fi service in its terminals earlier this year, delivering speeds that are up to 30 times faster than the previous option. Minneapolis–Saint Paul International Airport (MSP): Following a massive, multi-year renovation, the airport will have 50 new shops and restaurants by the end of this year . Washington Dulles International Airport (IAD): When it came to on-time departures, Dulles showed the most improvement over the past year, increasing the share of flights taking off on time by almost 8%. Phoenix Sky Harbor International Airport (PHX): Expect big crowds at Phoenix’s airport in March, typically its busiest month. The reason is largely a sporty mix of spring training baseball, NASCAR racing, and March Madness, along with some spring break visitors. Seattle-Tacoma International (SEA): Sea-Tac has seen a massive increase in passengers in recent years, jumping to become the ninth-busiest airport in the U.S. in 2016 (up from 13th in 2015). About 46 million passengers passed through the airport last year. Las Vegas McCarran International Airport (LAS): Flight delays? You can pass the time by trying your luck at one of the 1,300 slot machines positioned throughout McCarran airport. Much of today’s OOH is hyper-targeted, aimed at reaching specific demographics, a particular interest group, and even individuals. 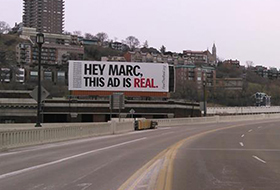 Once known as the greatest mass medium, OOH can now reach precisely its intended audience. And OOH remains an unparalleled mass medium, too. 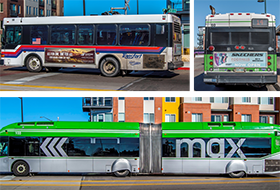 Lamar Advertising Company today announced its new transit advertising contract with the City of Fort Collins. The agreement will allow local, regional and national brands to reach consumers through a variety of advertising displays managed by Lamar on Transfort bus inventory.